For Immediate Release: Posted On 10/23/2014 By Industrial Magnetics, Inc.
Industrial Magnetics’ innovative, Large Tube drawer magnet is proving itself to be an industry-versatile magnetic separator. Typically used in the food processing industry for products with difficult flow characteristics, such as flour or powdered sugar, the Large Tube Housing(LTH) has found recent success in a paper recycling operation. The application involves shredding recycled news print, grinding it down into pulp and then remaking it into paper. The LTH rare earth magnet was installed after the shredding operation with two key tasks: to catch stray nuts or bolts in order to protect downstream grinding equipment, and to collect metallic fines to ensure a pure, metal-free end product. States IMI Product Specialist, Brian Hater, "The Large Tube Housing was originally conceived for a soft wheat processor, but we’re still discovering new applications and locations for installing this product. This happens to be a recycling operation, but the LTH could also be used in a load out or bulk receiving station for difficult flowing products". Designed with powerful, 52MgOe rare earth magnetic tubes that are three times larger in diameter than in IMI’s traditional drawer magnet housing, the LTH achieves 23 lbs. pull on a ½” ball, making it the strongest magnetic circuit available for gravity, metered and/or choke feed applications. The unit is offered in both EZ-Clean and Self-cleaning designs for removing collected metal from the magnetic tubes. Several options are available, such as Nedox coated tubes for abrasion resistance or food-grade silicone seals, and custom sizes and transitions can be manufactured to fit exact application requirements. 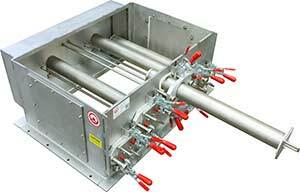 For more information, visit the Large Tube Housing product page.